A first-person perspective survival-horror game developed by Nearga. 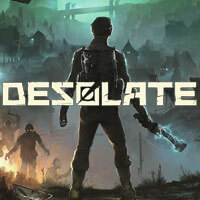 Desolate is a survival horror developed by studio Nearga. The title was released by the Russian company HypeTrain Digital. Desolate takes place on the fictional island called Granichny where the soviet conglomerate The New Light conducted secret experiments. Two years ago a mysterious catastrophe occurred there and the company attempted to hide its tragic repercussions. They failed to keep the secret and now people called Volunteers are sent there with the task of examining the paranormal activities and obtaining information required for creating a solution to the problem. As one could guess, the players assume the role of one of the Volunteers. They discover more about the events that happened on the island from letters and notes written by its old inhabitants. Events in Desolate are presented from a first-person perspective. The players can explore a vast, open world filled with abandoned settlements, secret research facilities and military bases. During the game the protagonist must face various threats – mutants with paranormal abilities, madmen, anomalies that can impact the mind of the untrained Volunteer. Luckily, the protagonist isn’t left without any weapons – the developers created various melee weapons and guns. As the players progresses in the game, new abilities are unlocked (and then improved), increasing player’s chances for survival. Despite that, frequently the best solution is to hide in the shadows and move behind opponent’s backs or to eliminate them from surprise. The game features an advanced crafting system – based on recipes and supplies gained during the game the players can modify their equipment and create new items. Although Desolate can be played alone, the game becomes more interesting when played with three other players in the cooperation multiplayer mode. Desolate features decent quality graphics – the grim colors are building the atmosphere of the title, just as the dark soundtrack. Expectations: 9.2 / 10 calculated out of 44 players' votes.